If you love literature, period pieces and all things very, very British, The Bookshop might click for you. It's fitting that a film centered partially on literary appreciation should possess a certain storybook quality. From the anonymously narrated opening moments of Isabel Coixet's new drama The Bookshop, such a stylistic intention is made clear. At times the approach makes for a pleasantly simple viewing experience, but the telegraphed nature of the narrative breeds a dull predictability. And despite the straightforwardness of the film's story, The Bookshop too often feels aimless and inconclusive. The film's protagonist, Florence Green, is played serviceably by Emily Mortimer. After several years mourning the death of her husband, Florence returns to her former home, the town of Hardborough, intent on converting her old house into a bookshop because, we're told by the narrator, she likes books. Beyond that motivation, and a brief anecdote about her husband reading to her nightly before bed, we're not given much reason to invest deeply in Florence's iron-willed intentions. Nor are we shown just why local aristocrat Violet Gamart (Patricia Clarkson) is so dead set on halting Florence's plans and converting the old house into an art center. Some narration about Florence's naiveté with regard to human nature seems geared to fill in the holes in the characters' motivations. Humans, the narrator explains, are split into two groups: the "executioners" and the "executed." Mrs. Gamart's blatant hostility and lust for control suggest she belongs to the former group, but we're not given enough context to further understand why she behaves the way she does. But even if one possesses as nihilistic a worldview as our narrator, it's tough to get invested in a conflict whose stakes feel shallowly designed around a broad philosophy. 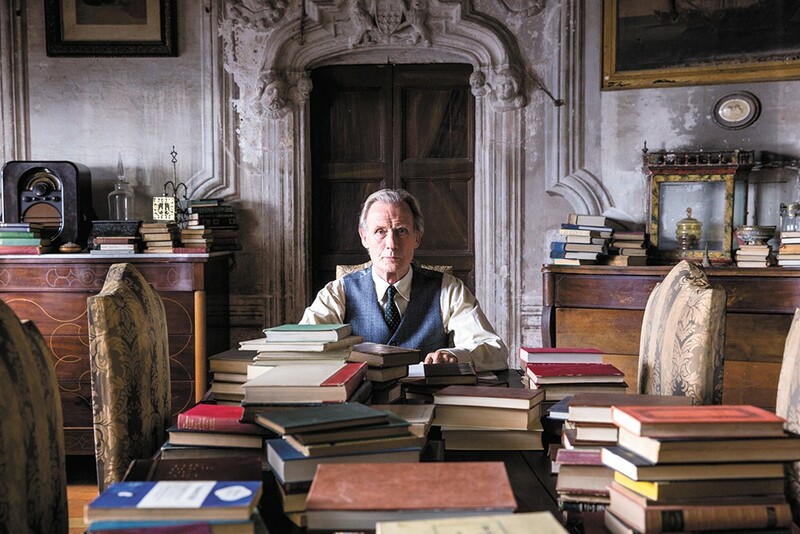 Oh, but Florence's courage sure is admirable, says the reclusive Mr. Brundish (Bill Nighy), a local widower who strikes up a book group-esque friendship with Ms. Green. Brundish is so taken by her resolve that he offers his assistance in battling the politically powerful, socially connected Mrs. Gamart. The friendship that Florence and Brundish strike up is sweet and sporadically poignant, but it does very little to separate itself from, or improve upon, the all too common archetype wherein an elderly person befriends a younger companion who helps him/her to see the world's goodness again. Making matters worse is the lingering sense of cameras on the actors at all times. Amidst what is often intentionally awkward dialogue between people who either don't like each other or don't know each other very well, Coixet frequently stages her subjects together in the frame, as opposed to in separate shots. The unintentional consequence of this decision is a reinforcement of the artificial, filmic quality of the proceedings. Also contributing to this issue are a multitude of short sequences showing nothing more than characters walking and bearing nondescript facial expressions. While occasionally striking for their visual symmetry, these shots more often feel unnecessary and unnatural. Perhaps the intention was to exaggerate the storybook nature of the narrative, but these stylistic decisions clash with the film's underdeveloped thematic subtext, and result in a final product that feels caught somewhere between a quaint, pleasant small town tale and a heavy philosophical meditation. Ultimately, The Bookshop succeeds at being neither. The original print version of this article was headlined "What's the Story?"